(Nanowerk News) For centuries, "man-made fibers" meant the raw stuff of clothes and ropes; in the information age, it's come to mean the filaments of glass that carry data in communications networks. But to Yoel Fink, an Associate professor of Materials Science and principal investigator at MIT's Research Lab of Electronics, the threads used in textiles and even optical fibers are much too passive. For the past decade, his lab has been working to develop fibers with ever more sophisticated properties, to enable fabrics that can interact with their environment. In the August issue of Nature Materials, Fink and his collaborators announce a new milestone on the path to functional fibers: fibers that can detect and produce sound. Applications could include clothes that are themselves sensitive microphones, for capturing speech or monitoring bodily functions, and tiny filaments that could measure blood flow in capillaries or pressure in the brain. The paper, whose authors also include Shunji Egusa, a former postdoc in Fink's lab, and current lab members Noémie Chocat and Zheng Wang, appeared on Nature Materials' website on July 11, and the work it describes was supported by MIT's Institute for Soldier Nanotechnologies, the National Science Foundation and the U.S. Defense Department's Defense Advanced Research Projects Agency. Ordinary optical fibers are made from a "preform," a large cylinder of a single material that is heated up, drawn out, and then cooled. The fibers developed in Fink's lab, by contrast, derive their functionality from the elaborate geometrical arrangement of several different materials, which must survive the heating and drawing process intact. The heart of the new acoustic fibers is a plastic commonly used in microphones. By playing with the plastic's fluorine content, the researchers were able to ensure that its molecules remain lopsided — with fluorine atoms lined up on one side and hydrogen atoms on the other — even during heating and drawing. The asymmetry of the molecules is what makes the plastic "piezoelectric," meaning that it changes shape when an electric field is applied to it. In a conventional piezoelectric microphone, the electric field is generated by metal electrodes. But in a fiber microphone, the drawing process would cause metal electrodes to lose their shape. So the researchers instead used a conducting plastic that contains graphite, the material found in pencil lead. When heated, the conducting plastic maintains a higher viscosity — it yields a thicker fluid — than a metal would. Not only did this prevent the mixing of materials, but, crucially, it also made for fibers with a regular thickness. After the fiber has been drawn, the researchers need to align all the piezoelectric molecules in the same direction. That requires the application of a powerful electric field — 20 times as powerful as the fields that cause lightning during a thunderstorm. Anywhere the fiber is too narrow, the field would generate a tiny lightning bolt, which could destroy the material around it. Despite the delicate balance required by the manufacturing process, the researchers were able to build functioning fibers in the lab. 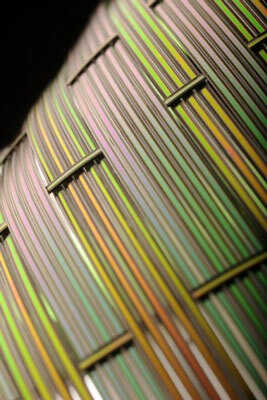 "You can actually hear them, these fibers," says Chocat, a graduate student in the materials science department. "If you connected them to a power supply and applied a sinusoidal current" — an alternating current whose period is very regular — "then it would vibrate. And if you make it vibrate at audible frequencies and put it close to your ear, you could actually hear different notes or sounds coming out of it." For their Nature Materials paper, however, the researchers measured the fiber's acoustic properties more rigorously. Since water conducts sound better than air, they placed it in a water tank opposite a standard acoustic transducer, a device that could alternately emit sound waves detected by the fiber and detect sound waves emitted by the fiber. In addition to wearable microphones and biological sensors, applications of the fibers could include loose nets that monitor the flow of water in the ocean and large-area sonar imaging systems with much higher resolutions: A fabric woven from acoustic fibers would provide the equivalent of millions of tiny acoustic sensors. Zheng, a research scientist in Fink's lab, also points out that the same mechanism that allows piezoelectric devices to translate electricity into motion can work in reverse. "Imagine a thread that can generate electricity when stretched," he says. Ultimately, however, the researchers hope to combine the properties of their experimental fibers in a single fiber. Strong vibrations, for instance, could vary the optical properties of a reflecting fiber, enabling fabrics to communicate optically. Max Shtein, an assistant professor in the University of Michigan's materials science department, points out that other labs have built piezoelectric fibers by first drawing out a strand of a single material and then adding other materials to it, much the way manufacturers currently wrap insulating plastic around copper wire. "Yoel has the advantage of being able to extrude kilometers of this stuff at one shot," Shtein says. "It's a very scalable technique." But for applications that require relatively short strands of fiber, such as sensors inserted into capillaries, Shtein say, "scalability is not that relevant." But whether or not the Fink lab's technique proves, in all cases, the most practical way to make acoustic fibers, "I'm impressed by the complexity of the structures they can make," Shtein says. "They're incredibly virtuosic at that technique."